WOLFBORO, N.H. — Heading up to Lake Winnipesaukee, where New Hampshire’s largest body of water meets the mountains, for a last blast of summer fun or some leaf peeping? You could pony up a cool $18 million for Longview, the 63,000-square-foot lakeside estate (still on the market as of this writing) owned by Bob Bahre, founder of New Hampshire International Speedway. Or, you could make a reservation at the “yellow house,” the Pickering House Inn, and save some dough for Bailey’s Bubble or the Yum Yum Shop. Located on Wolfeboro’s Main Street, across from Brewster Academy, the early 19th-century Greek Revival-style Pickering homestead began as a handsome private home before evolving into a faded boarding house and later a crumbling derelict. By 2015, the house had been listed by the New Hampshire Preservation Alliance as one of seven desperately in need of rescue. The historic residence — once one of Wolfeboro’s finest — was under foreclosure, and its barn was one nor’easter away from tumbling down. Then, one of the dollar-store chains swooped in to buy it. The Pickering house as a dollar store? “Nope. We were not going to let that happen,” says Patty Cooke. Cooke and her husband, Peter, both Massachusetts natives, had been coming to Wolfeboro since childhood and had brought their own kids to the lakeside resort town. The couple relocated there in 2010, cementing their connection. The house looked a bit daunting — “It had been abandoned for four years, so you can imagine what was living in it,” Patty says. But the couple took the plunge and bought it. The Cookes weren’t sure what they were going to do with it — neither had ever worked in hospitality — but “we’d turn it into a park before we let it become a chain store!” Peter says. 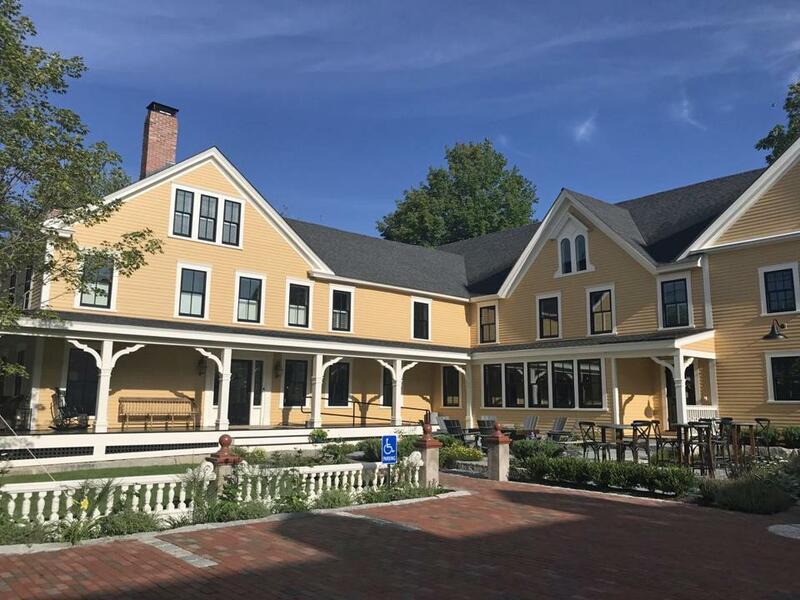 “When we realized that the town could use an upscale inn, that’s what we decided to do,” he says. It wasn’t such a stretch; Patty has a restoration and interior-design business, while Peter works in real estate and finance. Two years later — as of this July — the Pickering House Inn opened for business. Even the barn has been transformed; it is now the setting for “innkeeper’s suppers” and other events. Happy to see the home saved from demolition — or dollar store-dom — Wolfeboro residents followed the renovation closely and came out in force for a community open house. The Cookes won’t disclose the tab for renovation, but work to the three-floor inn was extensive. The design, by Patty, retains the structure’s original architecture while adding modern features like radiant-heated floors in the bathrooms, high-tech showers, and motorized blinds. Other amenities include toiletries from Beekman 1802 and Frette robes. The look is clean and spare with a mix of textures including reclaimed wood, metal, wicker, and stone. Two of the 10 guest rooms have gas stoves, and four others have gas fireplaces — a good thing, considering the inn is open year-round. (It will close for three weeks in March, during Brewster Academy’s spring break.) A fallen maple tree from the yard was transformed into a bar, and an upstairs hallway is lined with white doors that were salvaged during renovation. Public spaces include a library with games, newspapers, and books, and a first-floor refreshment station stocked with fruit, coffee, tea, and infused water. An afternoon snack — perhaps chocolate-dipped biscotti, prepared by the in-house baker — is offered around 3 p.m. Guests are treated to a hot breakfast in the “gathering kitchen,” where the innkeepers plan to host wine and spirit tastings and demonstration cooking-class dinners. From 3 to 7 p.m., drinks and small-plate menu items are available for purchase in the 26-seat spot. Other places to linger include a porch with chairs overlooking Main Street and a back patio with Adirondack chairs and a fire pit. And that barn! When it’s filled with townspeople and inn guests, settling in for a family-style innkeeper supper under the original hand-hewn beams and vaulted ceilings, it’s hard to imagine it was falling off its foundation just two years ago. As for that famous, 28-mile-long lake: It’s right across the street. One of the best things to do in fall, or anytime, really, is to drive all the way around it and explore the nooks and crannies and little towns. And then come back to the Pickering House for that afternoon snack. Pickering House Inn,116 S. Main St., Wolfeboro, N.H.; 603-569-6948; www.pickeringhousewolfeboro.com. Rates from $285; two-night minimum stay required in high season and during holidays.